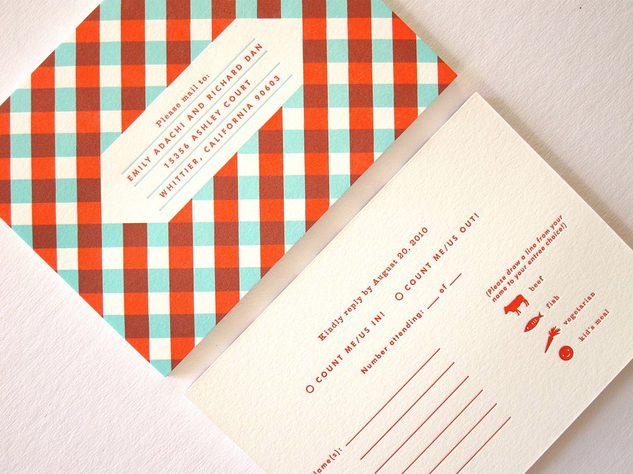 Erin Jang works her magic again by designing this most adorable modern wedding invitation. The combo of houndstooth, polka dots, and stripes are knocking my socks off. Erin you just rock. different and fun, sooo cute! I love them! I want to buy a set of those envelope. Too cute! your blog rocks! 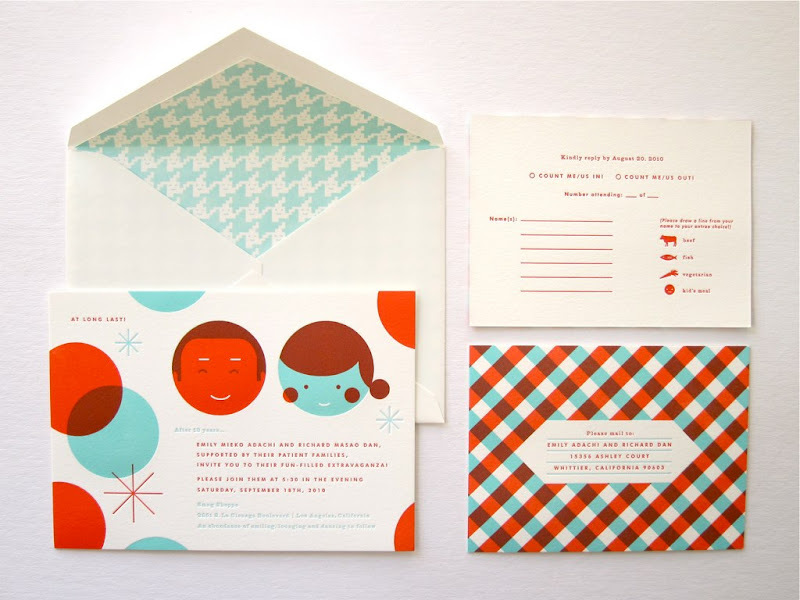 i just became a follower :) love the colors & patterns on these invites. great feature! This was a pleasant surprise as I was reading through blogs this morning....hooray!!! These were actually the invitations that Erin had done for my husband and I for our wedding last month! Thanks for putting a shout out to Erin. She is truly an amazing talent and I'm still lovin' our invitations. Awesome Emily - you are lucky duck to have her design them for you :) Congrats on your wedding! the details in every piece is so thoughtful. especially loving the inside of the envelope~ really loving how it has a modern + yet nostalgic feeling~ adorable! These are so cool...I love the colors. Adding them to my inspiration folder. These are great!! I wish I had more say in my wedding invitations 6 years ago! My mom said I would be the talk of the Greek church if I went with anything non-traditional! Ha! ...just finding your blog via the chirpy bird. LOVE IT!!! These are WAY great! Love them! oh love these and the retro color palette! How fantastic, adorable, and almost clean cut. I love these! Erin did a wonderful job on them. I love the colours and patterns she uses. I think it would be awesome to have her do your wedding book with pictures!